For mountain biking enthusiasts, Mongolia offers an experience unlike any other. The views of its beautiful valleys will take your breath away. 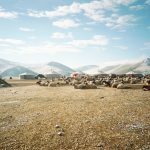 As you pedal through the Khangai Mountain range, you’ll encounter wild yaks, sheep, horses and goats as well as the friendly nomads that gather them into herds. Later, you’ll ride your bike through ruins from the ancient Mongolian Empire and other points steeped in history. When it’s time to cool off, the beautiful Orkhon river and the famed senkher river, famous for its hot spring baths, are also on the agenda. 8 days assisted biking trek, carrying a light back. This should present no serious difficulty for persons with at list some mountain bike experience, plus a good level of personal fitness. An experienced guide will leads this trek. We bike for 5–6 hours per day, on average, but this may be longer, depending on the weather conditions and group speed. Maximum altitude is no more than 2.200 m. Elevation change for most days should be no more than 400 m.
Arrive in Ulaanbaatar the capital city of Mongolia. Our guide and driver will meet us at the airport and help transfer to your hotel. The city tour of Ulaanbaatar takes you through some of the principal sights of this unique city. You visit the Gandan Monastery, which was constructed in 1809. Your tour also takes to the Chinggis Khan monument on the Chinggis Khan square and the Museum of National History. In the evening enjoy a traditional art performance and welcome lunch in a Mongolian restaurant. After breakfast, transfer to Arkhangai by 4WD, where you will start your ride. A day road awaits you in the direction of the west. Crossing the Bulgan aimag. 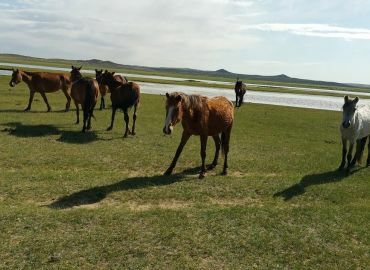 The mongolian first landscape: vaste, green steppes, flocks, isolated yurts and riders. Arriving at the village of Ulziit late afternoon. Installing the bivouac. Today, this morninig we get on our bikes and ride through a picturesque region dominated by dome shaped mountains, mixed woods, clear streams and lush grassy valleys. Our 4WD will transfers your bags and equipment, and you can come every afternoon and evening. You go along for about twenty kilometers the beautiful Orkhon river to the south, then you take the fork to the west. You pedal for forty additional kilometers on uncrowded track by vehicle and with little gradient. The green and barren steppes home to many herds stretch away. You spend close to villages and nomadic camps. Bivouac near the village Battsengel, along the Tamir river. You ride in the wide valley Ikh Tamir, following the course of the river. You are at the heart of the region Arkhangai or literally in Northern Khangai This province is particularly provided in archaeological remains from the Bronze Age to the thirteenth century. You are indeed close to the exceptional archaeological site Tsatsiin Ereg, a major site of the early first millennium in Mongolia. Over 26 “deer stones” and hundreds of petroglyphs were discovered in the last three campaigns. Many of these iconographies were defined as being associated with a funeral and ritual context, near Graves first nomadic tribes. You take the time to explore by bike this site and understand its fascinating history. 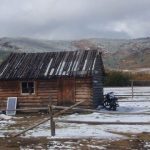 Today ride towards to Tsetserkeg, which is capital of the Arkhangai province whose name means “Garden”, is one of the greenest and attractive cities. View of the city from a surrounding mountain. Visit the beautiful monastery museum Zaya Gegeen. Visit and walking through the local market. Continuation our ride on track and on paths and came to the hot springs of Tsenkher in the afternoon. The water is at 85,5°C. Curative water and amazing nature featured by wooden mountains make this an excellent place for relax. Night bath is great. Sitting in the pool drinking while seeing stars at the dark sky is one of the favorite activity in here. The open air-baths are recommended. You go for two days to north-south, crossing of the beautiful hilly mountains of Khangai. You ride on tracks surrounded by steppe and following the course of the river Shirdeg to its source. Then the landscape is changing in forested mountains crossed by small streams along the altitude increases. You will join one of the sources of the Orkhon river and begin the descent to its irregular basin where it is shaped high waterfalls of 24 m. You cross many nomadic families during these two days, and the opportunity is always good to share a moment over a glass of tea. You can install your tents along the river. Today you will visit the nomad family and will experience and learn unique lifestyle of nomads by living and staying with them. You are free to taste the favorite drink of Mongolians – airag, fermented mare’s milk, traditional dairy products such as Aaruul or curdled milk dried in outside by the sun, suutei tsai or salty milk tea, boortsog – homemade butter biscuits fried in oil and so on. While staying here you will have plenty of possibilities to explore nomad way of life as talking with people, learning and sharing their culture and customs, and involve their daily works. Experience the milking cows, goats and sheep. The hostess of the family will show and teach you how to produce tasty and nutritious dairy products of “aaruul” and “byaslag”, a mongolian cheese and blend traditional vodka called “Shimiin arkhi” e.t.c. Today after breakfast we start biking along Orkhon River Valley. The cycling today is one of the nicest with wide open valleys, herds of sheep and cattle, nomad horsemen and their family gers dotted around the landscape. 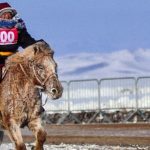 We ride through ancient lava flow and cross the Orkhon River until finally arriving at Orkhon Falls called Ulaan Tsutgalan. Enjoy spectacular view of the waterfall and surrounding area. This waterfall drops into 25 km volcanic crack thus forming the 24 meter high waterfall of Ulaan Tsutgalan. Tonight will be in tents. The 2nd day, continue cycling to Kharkhorin. This ancient capital of Mongolian Empire was built as far back as the 8th century with the name “Takhil Shivee”. Only in 1220 Chinghis Khaan declared it as the capital city of his Empire. Until 1235, Karakorum seems to have been little more than a ger town, and Ogedei Khan gave the decree to build the Karakorum. After the collapse of the Yuan dynasty, in 1388, Ming troops took and destroyed the town. 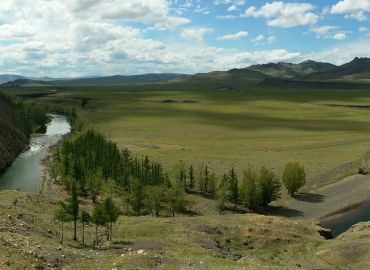 We follow the Orkhon River Valley for the whole day, cycling across the vast lava flow. This is our final ride. Tonight staying in a ger camp. In the morning visit the Erdene–Zuu, the first buddhist monastery in mongolia. Abtai Sain Khan, ruler of the Khalkha Mongols and grandfather of Zanabazar, ordered construction of the Erdene Zuu monastery in 1585 after his meeting with the 3rd Dalai Lama. After packing the bikes we drive to the Elsen Tasarkhai or “Little Gobi”, erected in the middle of the plains. You can have an optional camel riding on the sand dunes. The ecosystem of this park is particularly interesting, because the steppe and the taiga meet here. So, we can find a fauna and a flora that are characteristic of these two ecosystems, and also some wonderful landscapes, with the granite formations of Khogno Khan. Today we drive back to Ulaan Baatar arriving mid afternoon. Shop at cashmere and souvenir shops. Farewell dinner with your interpreter and driver in a Mongolian restaurant.